The upcoming flagship will come in two versions, but Oppo did not confirm yet the rumors concerning the impressive 50 MP camera. 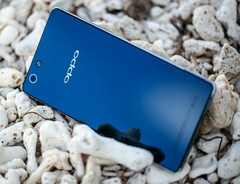 Chinese smartphone manufacturer Oppo already managed to draw attention with its current line of products, but the upcoming Find 7 flagship could do more than just that if it gets released with a 50 MP camera as rumored. According to an official teaser image recently revealed, two versions of the handset will be launched later this month, but it is not known yet if both will feature the image snapper mentioned above. Oppo's teaser image shows the launch date and the two resolutions, one for each of the two versions of the Find 7 flagship - Full HD (1,920X1,080) and 2k QHD (2,560X1,440). While this information can be considered official, the specs are not confirmed yet. Rumors claim that the Full HD version will use a Snapdragon 800 processor coupled with 2 GB of memory, while the high-end QHD variant will get a Snapdragon 801 and 3 GB of memory. More than the above, the new Oppo Find 7 is expected to break the rules and use a removable battery, while its impressive camera will be capable to deliver images with resolutions up to 8,160X6,120 pixels. This way, the 41 MP camera of the Nokia Lumia 1020 will finally get a worthy opponent. Oppo will launch both flavors of its new flagship in Beijing on March 19. We will get back to this topic as soon as more specs get officially confirmed.